We can all agree that U.S. Deputy Attorney General Rod Rosenstein committed more felonies than anyone he is ever prosecuted combined. In January this year, it was revealed that Rosenstein approved to extend surveillance of former Trump campaign adviser Carter Page shortly after assuming office last spring. Following this, on Tuesday, Freedom Caucus Chairman Mark Meadows (R-NC) called Rosenstein to recuse himself immediately because he signed the Carter Page FISA application. 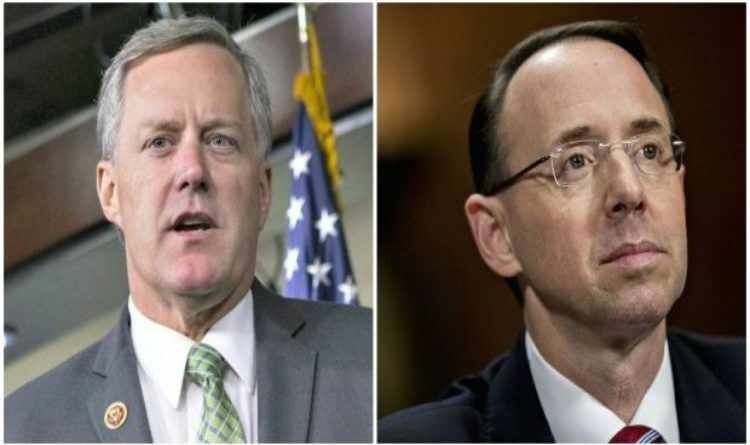 Meadows called the DAG a “witness” in the ongoing investigation of the DOJ and posted t a screenshot of Rosenstein’s signature on the Carter Page FISA application and called for the DAG to step aside. Meadows: “Potential FISA abuse has been a central issue in Congress’ investigation of the DOJ. The Carter Page FISA application revealed Rod Rosenstein signed the document and authorized surveillance. Mr. Rosenstein is a fact witness and should recuse himself from this process immediately. More importantly, Redactenstein is a card-carrying resist insurance policy leader. He is implicated. Conspiracy, obstruction, abuse of power, gross negligence. He’s part of the play we are watching. Bottom line, this “investigation” was illegitimate from the get-go. There was no crime named as a foundation for opening a special counsel investigation and that is required by statute. It has never been anything but the “insurance policy” named by Strzok and several DOJ and FBI officials are in on it. Unfortunately, it’s going to take a hell of a lot more than a request for Rosenstein to recuse himself from anything. You have to have ethics and some honor. This guy has none.